Posted on January 16, 2017 at 1:13 pm. If you’re like a majority of Aussies, you probably brought in 2017 making promises to yourself that you’d eat better, exercise more, drink less, quit your vices and be an all-round better version of yourself. The team at Guts.com has a theory – that the good intentions behind people’s New Year resolutions don’t last long. Instead, they think the best thing to do is not to take these good intentions too seriously, and are instead rewarding players with a whole bunch of doughnuts. Yes, you heard right, doughnuts. Not real doughnuts (don’t worry – your dreams of living out a healthy 2017 are still in check), but virtual doughnuts that can be exchanged for free spins. 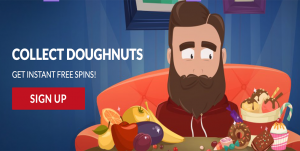 If luck is on your side, those free spins can be used to win real money, which you can use to spend on whatever your heart desires, be it actual doughnuts or supporting your new green smoothie habit. Head to Guts.com and log in, or sign up for a new account if it’s your first time at this casino to claim up to $500 in new player welcome bonuses plus 100 free spins. Make sure your account is funded with some real cash, as you’ll need to be playing for real money to get involved. Head to the casino banking section to load up. Start playing games at Guts for real money bets and you’ll notice that the doughnut progress bar at the top of the screen inching along every time you play. Certain games will contribute to your progress more than others, with pokies contributing the highest, so check the terms and conditions of the promo for full details. Every time you fill the progress bar, you’ll receive a notification letting you know that you’ve been rewarded with a doughnut. Click this notification at any time and you’ll be asked to select your resolution to earn free spins. If you’re wondering what we mean when we say “select your resolution,” this will become clear as soon collect your first doughnut. You’ll be presented with two game choices – one which supports the habits of a good new year resolution, while the other supports the honest voice within that tells you to give in to temptation. For example, when asked how you’ll be eating in 2017, you’ll have the choice to pick between Fruit Shop or When Pigs Fly. Whichever game you choose is the one you’ll receive your free spins on. This fun, unique promo is running at Guts Casino from the 12th to the 31st of January, so get playing today to start pumping that progress bar and earn as many doughnut free spins as possible. There are 15 progress levels all up, that’s 15 tasty doughnuts, so what are you waiting for?